Plants brown to yellow-brown, up to about 8 cm tall, comprising tufts of branched uprights attached by rhizoidal holdfast; erect axes terete to compressed, 1-2 mm wide, 3-6 times dichotomously to irregularly branched at angles of 30-50o, apices pointed, often forked. Structure solid, with medulla of large colourless cells surrounded by cortex of small pigmented cells; hair tufts emerging through cortex, scattered over thallus. Plurilocular sporangia up to about 55 µm long, in sori, often associated with hair tufts. Epilithic, found in wave-exposed sites in the lower eulittoral/eulittoral fringe. Recorded from Dwesa to northern KwaZulu-Natal (44-58). World distribution: Widespread in tropical and warm-temperate waters; in southern Africa also recorded in Mozambique (Guiry & Guiry 2011). Type locality: Port Natal (Durban), South Africa (Tronchin & De Clerck 2005). 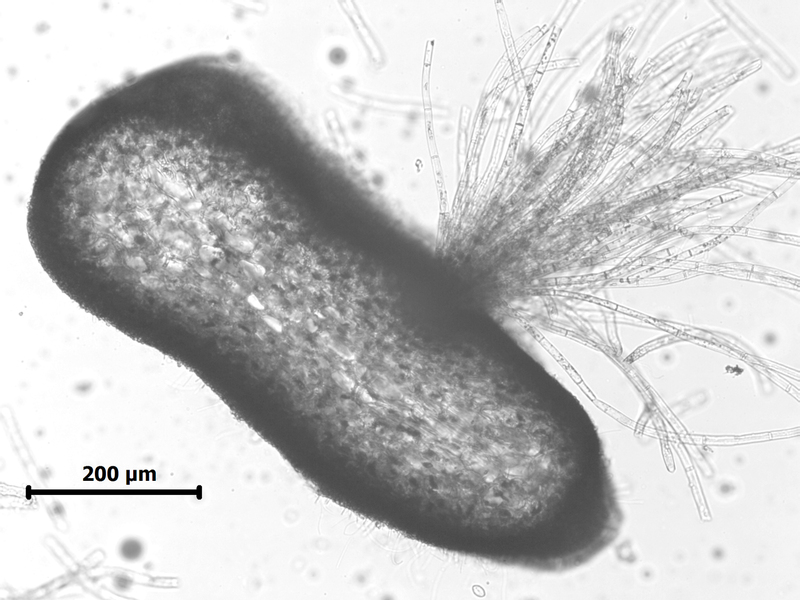 Chnoospora minima, xs of thallus showing plurilocular sporangia (Mkambati specimens, stained slide). 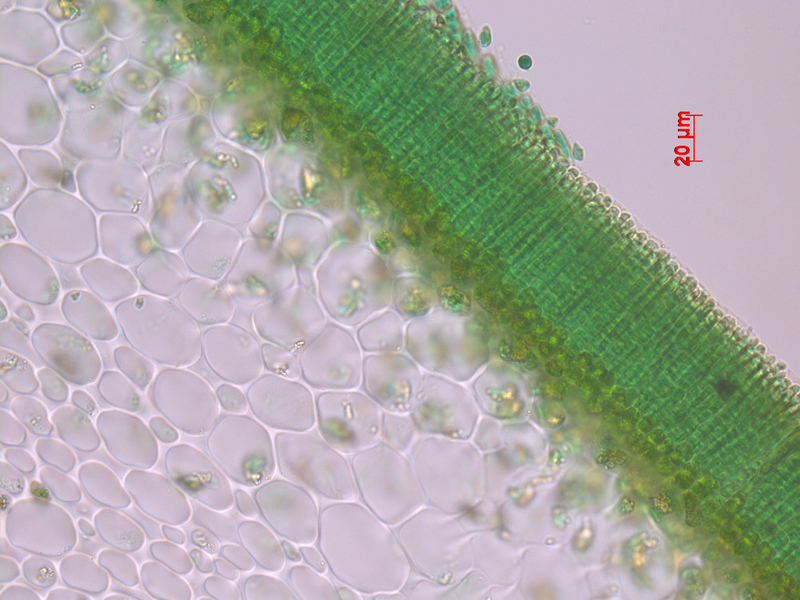 Chnoospora minima, xs of edge of thallus showing tuft of phaeophycean hairs. Guiry, M.D. & Guiry, G.M. 2011. AlgaeBase. World-wide electronic publication, National University of Ireland, Galway. http://www.algaebase.org; searched October 2011. Tronchin, E. M., & De Clerck, O. 2005. 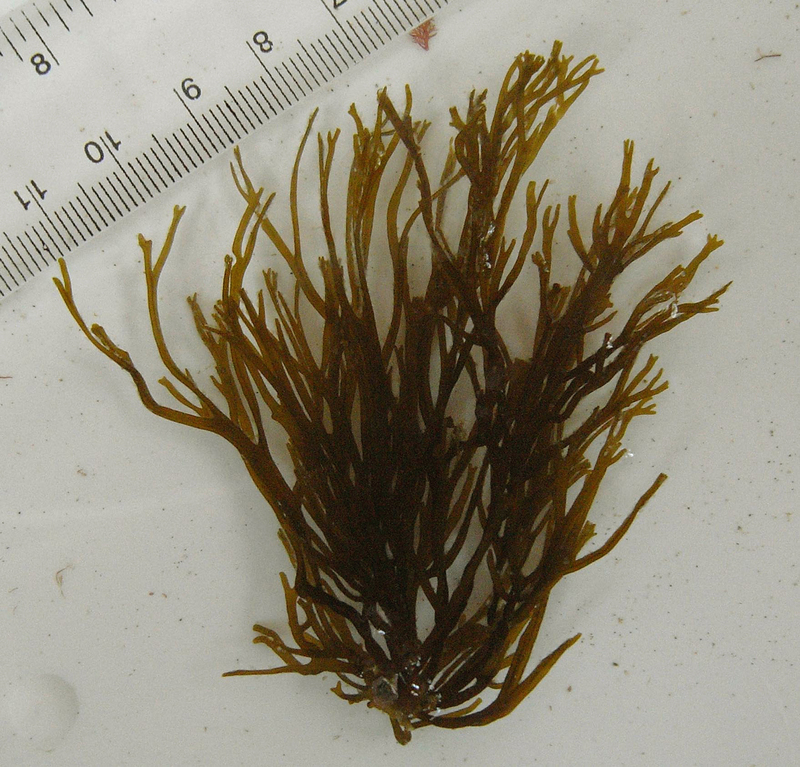 Brown Algae. In: De Clerck, O., J.J.Bolton, R. J. Anderson and E. Coppejans, 2005. Guide to the Seaweeds of Kwazulu-Natal. National Botanic Garden of Belgium, Brussels (Scripta Botanica Belgica), pp. 96-129.